An electric bike tour full of easy pedaling, compelling stories, essential neighborhoods, and the best views in the city. The tour lasts 5.5 to 6 hours and starts and finishes in the hip Hayes Valley neighborhood near City Hall. A lunch stop is included (lunch not included in tour price). 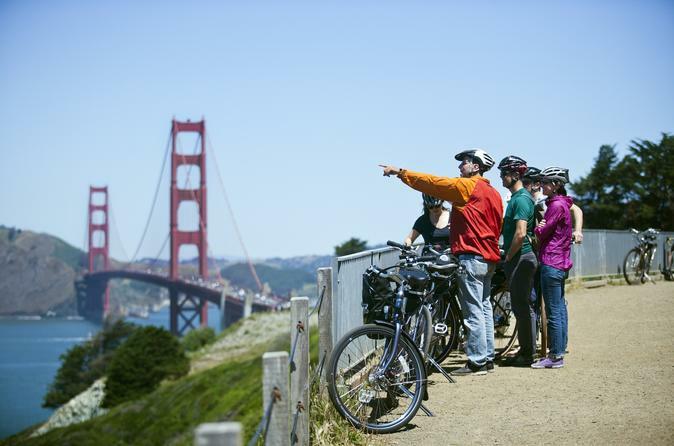 San Francisco is View City, and with our e-bikes, we can take full advantage. Our electric bike tour visits the neighborhoods and parks we love but aren’t easily accessible on ordinary bikes. Our e-bikes have plenty of power and battery capacity to propel us through the city and over the hills, and on this big 20-mile loop, we visit quintessential SF neighborhoods, the city’s most beautiful parklands, and the stunningly rugged Pacific coast. We also get the best views of the Golden Gate Bridge (assuming Karl the Fog isn’t covering it). We don’t worry about hills because our e-bikes help us do the climbing. This tour has opened up so many new places for us to visit. We couldn’t be more excited to show you around electric-style. We’ll stop for lunch about halfway through the tour. Veggie and vegan options available. Tours depart at 10am from 370 Linden St. in the Hayes Valley neighborhood. A lunch stop is included, but lunch is not included in the tour price. Please arrive 25-30 minutes early to get fitted to your bike and practice riding an e-bike. Special Offer - Book and travel by November 27 and save 10% off our previously offered price! - Book Now!